The lure of cheap homestead land has populated much of North America. In the Bulkley Valley it has been no different. Around 1900 pack trains came through the valley and some of the men noticed choice properties when traveling through. Charlie Barrett was one of them, settling on the Diamond D Ranch, where, as the tale goes, there were fields of wild grasses growing to a man's shoulder, ideal feed for horses and cattle. Barrett was one of the early farmers of this area, producing hay needed for packhorses during the building of the railroad. Barrett brought in one of this area's first threshing machines. Diamond D Ranch was later taken over by Jack Price, and today Dr. and Mrs. M. Yaremco live on this property. The first farmers in the area included Neil and Archie McInnes, who took up land east of Houston (Pioneer Ranch and Meadowbrook Farm at North Bulkley) in 1903. The McInnes' were the first to bring into the area by packhorse a mowing machine and a hay rake. The McInnes' planted gardens, reaping in those early years cabbages weighing as much as 27 pounds, and turnips of 19 pounds, as well as bountiful crops of cauliflower and potatoes. Archie McInnes binding a great crop of oats. Gabriel La Croix was the first to bring a milk cow into the Bulkley Valley in 1903. Frank and Harry Latta, Herbert Silverthorne, Harry Davis, Jack Adams, Joe Allen, and George Dungate were others among early ranchers and farmers. In 1911 the Latta brothers hired E.G. Bellicini to help fence off the field west of town (where the Sullivan Pontiac dealership is located in 1999) so that free-ranging cattle and packhorses from Diamond D Ranch could be kept out and hay could be harvested. Tom Aitken (father of Nancy Goold and Betty Dungate) operated Glenview Farm (North Bulkley) in 1908, mixing shorthorn cattle and a flock of sheep. He was the first sheep farmer in the area. < p> Land was easily available. In 1916 George Dungate bought 160 acres of heavily timbered land east of Houston for $10 an acre. He used a hefty team of horses, an axe, crosscut saw, mattock and shovel to hand-clear the property, and it became known as Pleasant View Farm. This land was sold to the Haftners in the early 1930s, who in turn subdivided the land in the late seventies. Keith Daye owns part of this property in 1998. The bench portion of this land was known in 1983 as the Holt Subdivision. The Houston early farmers were stump farmers. With no large machines to clear them away, stumps were left to rot in the fields while the farmer planted and harvested around them. Caterpillars did not appear on the scene until the later 1940s. Newly cleared land was seeded in oats with brome or timothy. In the 1920s dairy cattle were introduced on a larger scale. Milk separators made it possible to sell cream to a creamery in Telkwa, the cans being shipped there on the train. The skim milk was fed to pigs, although raising hogs never flourished in the area because of the absence of large amounts of grain for feed. Some farmers began profitable dairy operations in the 1950s and 60s, shipping milk and cream to dairies in Kitimat and Prince Rupert. The creamery in Telkwa had closed in 1946, but later a modern milk plant was built in Smithers. In addition, Houston dairy farmers such as Albert and Marie Seinen (Alma's Dairy) and Herman Ruiter, both with Grade "A" Dairy licences, bottled milk in glass bottles and began door-to-door delivery services of milk and eggs. Shortly after World War II broke out, there was an initiative in the Bulkley Valley to grow garden seed to supply European countries occupied by the enemy. During the war, several Houston farmers recently immigrated from Holland, including George Prins, Thys Stad, Nanne Vriend and Norman Groot, grew turnip and spinach seed to ship to Europe. Bill Stad remembers about five acres of spinach seed on the Stad's farm in Barrett that had to be kept clear of weeds and was harvested by hand. 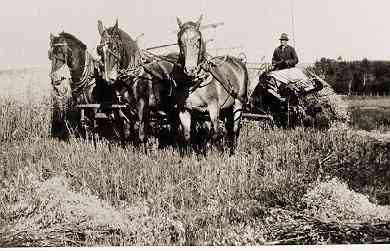 By the late 1940s farmers were again producing hay, this time to support an growing beef industry. The cattle could be herded into open range for the summer. In the fall, surplus cattle were shipped to market in Edmonton or Vancouver. During the 1940s and until the 1960s, Houston farmers did well growing potatoes and vegetables such as turnips, carrots and cabbage. Truckloads of cabbages were sold to Prince George, and there are stories of potatoes sold by the boxcar. A new variety of cabbage was developed by Nanne Vriend in Houston, called the 'Houston Evergreen', which was well suited to the local climate and was eventually recognized by leading seed houses in Canada and the U.S. Since 1970, when the logging and sawmill industry rather abruptly took over the Houston economy as well as several key farms, agriculture has fallen into a less than desirable way to make a living. Ready jobs and good wages in the bush or at the mill proved to be more attractive than working on the land, especially to young people. Older settlers and immigrants clung to their farms mostly to maintain a lifestyle, but a reliable income from the land was no longer guaranteed. Today, farming continues to be a lifestyle for many, but a livelihood for few.